I’m here! In Barcelona! It has started. I arrived last week’s Sunday evening, just in time for the start of the Business Spanish Program (a 2 week intensive course for all the non-native Spanish speakers). I met a ton of incredibly interesting people at the first day event, where we received our welcome and health care documents. Everyone is indeed very international and has lived or worked in other countries than his own. There are really a lot of impressive backgrounds on campus here. The atmosphere was very open – you basically walked up to everyone you saw, introduced yourself, chatted a bit about each others background and then tried to remember all those name. After taking part in a 15-minute evaluation Spanish group discussion, I was placed in level 3 of 12. It’s a comfortable level for my previous merely basic Spanish knowledge base. So far I had a lot of fun learning Spanish the last couple days. My group is great and has people from Taiwan, Korea, U.S.A, Serbia, Greece, Netherlands and Germany in it. Many of those have then lived in different continents for a long time. We’re 10 persons in the classroom and are very openly discussing and speaking in Spanish. So far it’s very effective and has considerably lifted my Spanish speaking confidence. I have no problem speaking and practicing the language in taxis, restaurants or bars. I’m also pretty dedicated on getting this language up to a professional level now. It’s done. I secured an apartment. With the help of my two soon-to-be roommates, who organized all the visits, I looked at a few apartments after the Spanish classes. We paid the reservation fee for a 130 sqm, 3 room apartment in the center of Eixample, exactly the area where we wanted to live. The only drawback: It’s only available in a month and each one of us has to find a place to stay until then. I’m still in the process of figuring out the best option. It definitely feels good to know where you’re going to live and that you don’t have to spend time on checking the apartments online and visiting them in reality anymore. 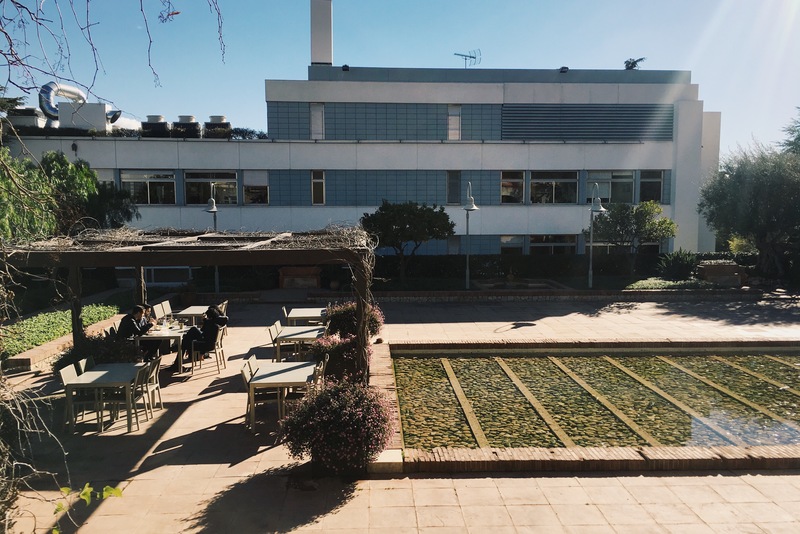 There have been a couple of social events so far: Several lunches and dinners and a big Saturday night get together among most of the IESE first-year students who are already in town. It was good fun. I also played Beachvolleyball with a few guys and have football coming up tomorrow. The day is pretty much covered with the BSP, which goes until 18:15 every day, and doesn’t leave too much room for larger social activities. But I’m sure there is much to come. This is my Spanish group on the roof of the IESE North Campus. I went running up the Tibidabo, and this is the view you’ll get for that. Okay, I just booked my flight to Barcelona! I’ll arrive just the evening before the intensive Spanish classes begin. Quite last-minute, but what to do; I am busy all along and can’t arrive earlier. I also still don’t have a place to stay, but this will hopefully change, before I land in BCN. I have a group of people with whom we are trying to find an apartment together. Anyway, if everything fails, I’ll take an AirBnB or sub-rent a room for a short period and start looking for housing, when I’m there. Of course, it would be better to have that item off the list as soon as possible, not to interfere with academics. I have to start reading through my case interview preparation book and start to solve some cases. I am not sure if I can still accomplish to do that before Barcelona though, – the other tasks have priority. And then, there are hundreds of other things, that are not directly IESE related, but have to be done before leaving the country. I’ll leave local things like opening a bank account, getting a Spanish cell phone number, buying a moto, getting the NIE (Número de Identificación de Extranjero), and whatver there is to come, for the time when I’m actually there.